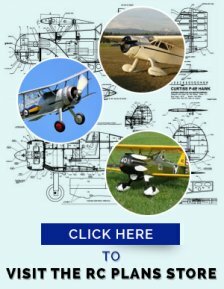 The RC Model Airplane Engine: The O.S. FS-120 MK.3 Surpass. 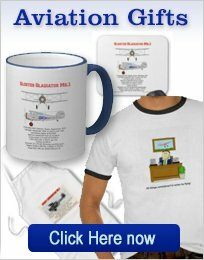 Maybe the most popular 4-stroke model airplane engine in the O.S. range. A full description, along with CAD drawn 3-views. 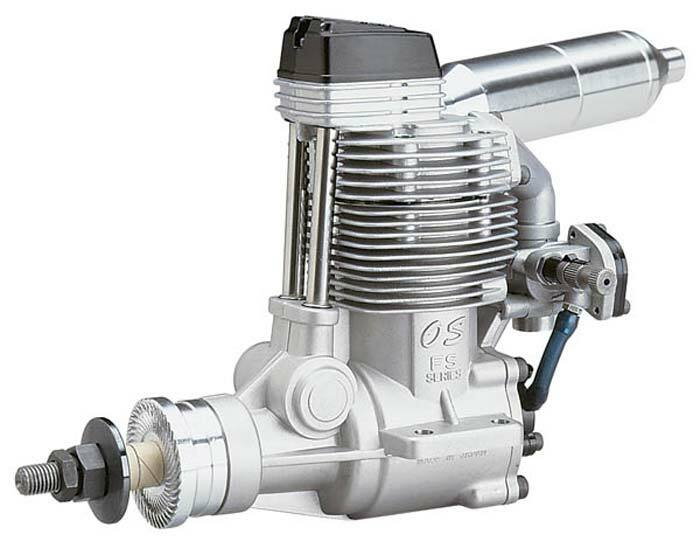 The "Surpass", in the name means this model aircraft engine is the second series of 4-stroke engines offered by O.S. The Surpass engine has 30% more power than it's predecessors. I have owned 3 of these engines and can testify to the great service and long life you can expect if you own one. Specially developed PD-07 Pump. 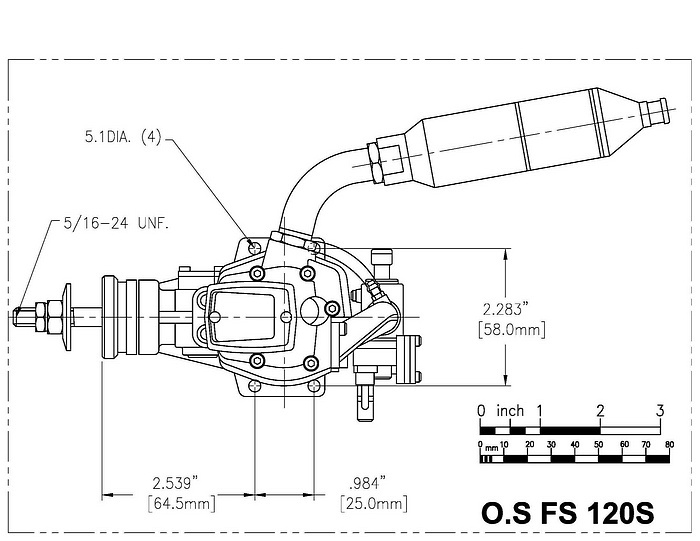 This unit ensures a reliable fuel feed to the engine. You no longer have to be concerned with tank position. the fuel feed is always constant. Ball bearing supported crankshaft and camshaft. A good ,substantial plastic mount is recommended for this type of model aircraft engine. This type of beam mount can then be bolted to a ply box (1/4" thick) or dowel stand-offs can be used. 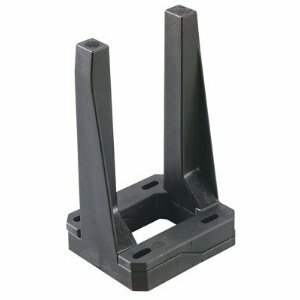 The photo shows the Great Planes Adjustable Engine Mount 1.20-1.80. I have used these on my last 2 projects and found them ideal. I prefer to tap the mounts and use # 8 or # 10 socket head capscrews. If space is required to achieve the correct spacing for a cowl, then I have had great success with dowel stand-offs. Take a look here for more information- RC Engine. A tank size of around 15oz will be good for this model airplane engine and this amount of fuel should last for 14-15 minutes. Nitromethane content should be between 5 and 15%. Oil content should be 18%. Synthetic or a synthetic/castor blend. 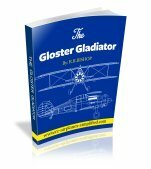 I would not suggest an all castor oil mix, as this tends to produce varnish in the model airplane engine and makes a real sticky mess in the exhaust! I have not found it necessary to provide glow heat at low throttle settings, even with the engine mounted inverted. The O.S. "F" type plug is very good in these conditions. When the engine is fully cowled, I do prefer to use a remote glow connector. This makes glow hook-up safer and easier. Very smooth running engine with a minimum of vibration. Easy starting with an electric starter. Usual O.S. first class materials and construction. Non critical tank position because of the fuel pump. Higher price ( Worth it, in my opinion). Messy clean-up- typical of all glow engines. The 3 drawings below were drawn using Autocad. If you click on the drawings you will have access to a PDF version. I have tried to make these drawings as close as I can to full size, but there are a lot of variables at play here! 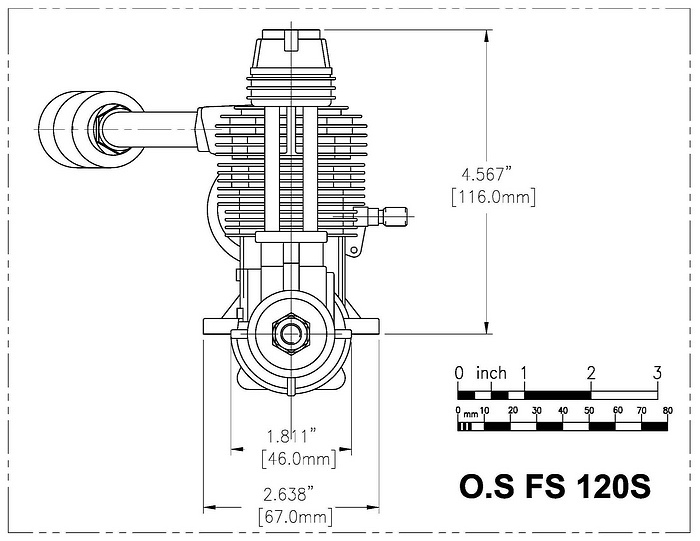 The inch and metric scales you see on the drawings should help in scaling any dimensions. and/or scaling the print scale. 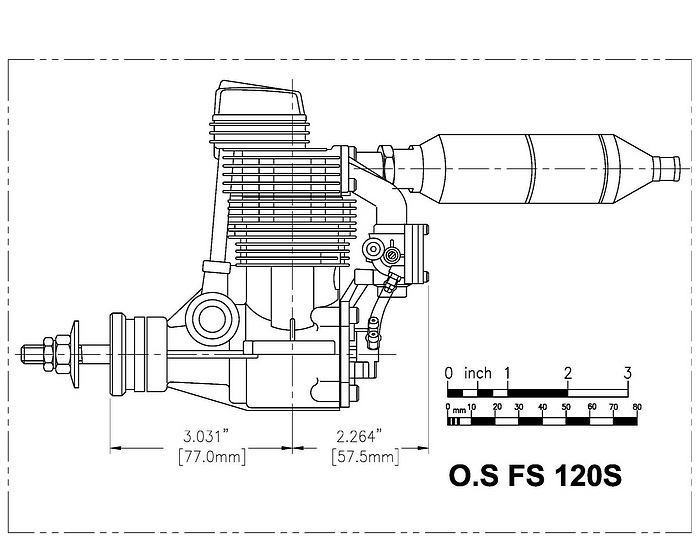 Type: 4-stroke, overhead valve with pump. Power Output: 2.1HP @ 12.000 RPM. Fuel: 5-15% nitro with 18% lubricant. Needle Settings: High speed-1.5 turns open. Mixture Control: Low speed-2.5 turns open, with throttle fully closed.